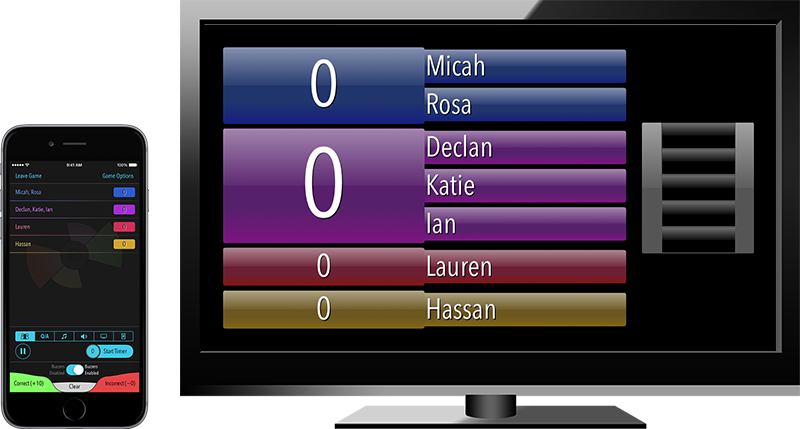 Game Show Studio lets you host your own trivia game show in your home, classroom, or workplace. It gives you everything you need to put on a stunning and interactive show, including sound effects, graphics that can be displayed on a television, trivia questions, and an easy way for players to buzz in wirelessly using their iOS devices. 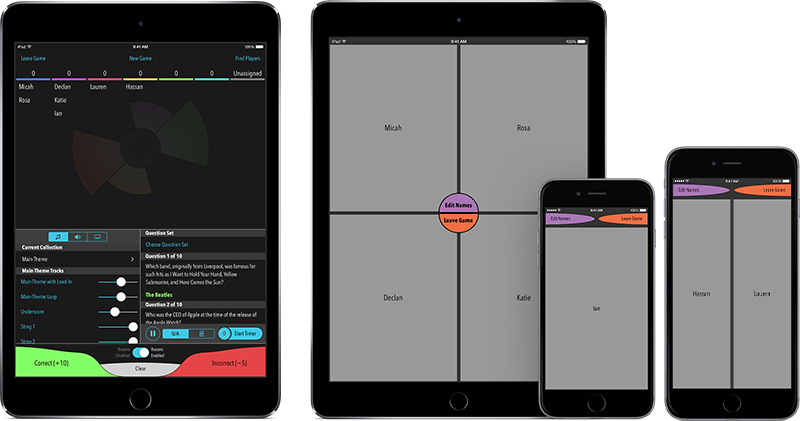 Game Show Studio can connect iPhone and iPad devices using Bluetooth or Wi-Fi. When a player joins a game, his/her screen becomes a button which can be tapped to buzz in, sending a wireless signal to the host’s device, which will play a sound and indicate which player buzzed in first. Do you have more players than iOS devices? No problem! You can let up to four players use the same device to buzz in. In this case, the screen will be divided into sections so that each player on the device can buzz in by tapping their region of the screen. All of this enables you to give the players of your game an exciting and immersive experience. Other sound effects play automatically throughout the game so that you, the host, can concentrate on keeping up a fast-paced game. Whenever a player buzzes in, for instance, a sound is played, providing immediate feedback to the host and the players. If you connect the host’s device to an external display (like an Apple TV), you can show useful game information to all the players in the room. The display includes the names of all players of each team, the score of each team, and the customizable timer that counts down when a player buzzes in. This also makes it easy for everyone in the room to see clearly who buzzed in first. While this adds even more to the complete “Studio” effect, an external display is not required; all of this information is also displayed to the host on his/her device. The color of each team (represented both on the host’s device and on an optional external display). Downloading Game Show Studio is free. Players can join games for free. In order to support the developer of the app, hosting a game requires an In-App Purchase. You will have an opportunity to try all the hosting features before you buy, including connecting to players, playing sounds/music, allowing players to buzz in, and connecting to an external display. And if you decide you want to host a full game, only you have to make the purchase; your friends can download the app on their devices and connect to your game for free. Have a question about the app? Contact the developer: tim@gameshowstudioapp.com.